If you have ever Backpacked or Primitive Camped, Hunted, or gone Fishing, you probably already know at least 10 Uses For A Bandanna. A Bandanna is a very important piece of cloth. A Bandanna could actually save your life. I always carry several when Outdoors and they are good to have around the home too. Bandannas are very easy to hand wash and they dry fast. One of the reasons they are so good to have around the camp. One minute you are using one for a napkin, later you are washing dishes with it, the next day you are using it for a band-aid, and on the way home, that same bandanna is keeping your neck warm. One of the KOOOL things about a Bandanna is that they could come in just white, but they do not, they come in an array of colors. One of the reasons might be is that years ago a person might carry a Handkerchief and a Bandanna....and after that person blew their nose in the white Handkerchief, you would want to know the difference...and yes, many people also use a Bandanna for a Handkerchief. You can easily make Bandannas in any color or print you would like to own. 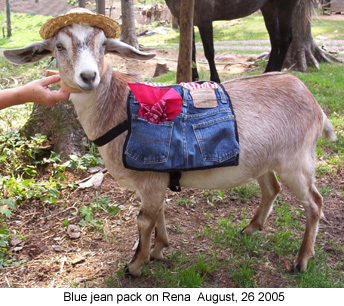 Think how much fun you will have in camp with your Goat Packing Friends or Horse Packing Friends if you made bandannas out of the animal prints of the animals with you on the trip. Or make them to match your clothing or Backpacks or just in your favorite colors. These pages are copyrited. Many of these ideas are used and have been used for many people over many years, but some will be new and unique. 1. A Bandanna could be used to blow your nose into. 2. A Bandanna can tie your hair back out of your face or up in the hot weather. 3. A Bandanna can be worn over your face to rob a train...well, not so much any more. 4. A Bandanna can be used as a wash cloth. 5. One could be used to wash dishes with. 6. One could be used as a sling for an injured arm. 7. Use a bandanna for a collar or decoration around your dogs neck. 8. Tie one around your leg, just above your knee for decor/fashion. That way you have one with you when you are hiking or camping at all times. 9. Use one to signal a plane or helicopter if you are stranded and or need rescue. 10. On a hot day wet down a bandanna and wear it around your neck. It will help you cool down. 11. Use one for a knee cushion when praying. 12. Wear one around your head to keep your ears warm. 13. Use a bright bandanna on your pack animal for visibility. 14. A bandanna can wipe the sweat off your face/body. 15. Wipe the dust off your clothing and shoes with a damp bandanna. 16. Wear over your face in a wind storm or snow storm. 17. Carry berries or rocks back to camp in a bandanna. 18. Use to tie a splint unto an injured leg. 19. Use as a band-aid. 20. Use as a torniquet. 21. Bite down on it in pain rather than screaming out. 22. Wear a Bandanna around your neck to keep you warmer or to keep the draft of the wind from getting into your clothing. 23. Wear a Bandanna around your neck to keep from getting a sun burn. 24. Use one to teach an animal to fetch clothing for you. I have taught this to dogs, goats, horses, and a donkey. I can send them after a dropped glove or other items when I am out working around here. 25. Wrap a wet bandanna around a fresh bouquet of flowers. 26. Give Bandannas as gifts to your outdoorsy friends. 27. Folded over and with the help of a sewing kit, a bandanna could become a patch in a tore Backpack. 28. Folded a bandanna could become padding between your sore arm(s) and your Backpack strap. 29. 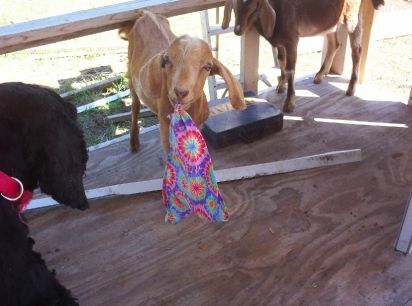 When packing with animals, carry extra clean and dry Bandannas between pots and pans in your animals packs. This will keep your animals more calm without the rattling going on in their packs. This also gives you more Bandannas if they are needed on the trail or in camp. 30. 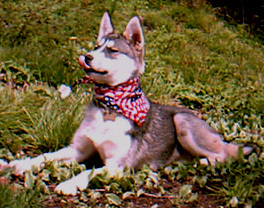 If one of your pack animals, or just your pet dog, would be injured, a bandanna could become a leg wrap. A bandanna could also be padding under vet wrap for more comfort for the animal. 31. Folded or scrunched up, a bandanna, could become a pot holder for a hot handle. 32. Did your chair or vehicle seat get to hot to sit on while you were hiking? Put your bandanna down on it and have a seat. 33. Use a Bandanna for a napkin while eating. 34. Wipe up messes from something that spilled. 35. Need a cloth while cleaning fish? Use a Bandanna. 36. Use one for a cushion on a bucket handle. 37. 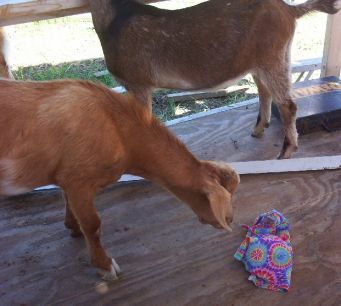 Slip your goat bell unto a bandanna and tie the bandanna around your goats neck in camp. The bell will let you local the goat at all times...unless you quit hearing the ringing, then it is time to go and find your goat. 38. Hand food in trees at night inside a bandanna. Use a rope to tie it off and up. 39. If your pack animal has a rub spot from the trip in, use a bandanna, inside the pack, in that area to give the animal a bit more padding. Never however carry sharp or items with a pencil like end next to the animal's body. 40. Spray bug spray on bandannas rather than your skin. Wear the bandannas over your clothing to keep bugs at bay. 41. If you forget your rope when hunting, use your bandanna to tie off and carry your game back to camp. 42. Use to strain liquids through. Surely I do not have to tell you that this is not, however, a water filter. I mean like when making noodles or foods that need straining from the water. 43. Tie a red on to the back of a pack equine's tail that kicks (universal trail language for a kicking equine). 44. Tie around your wrist to remind yourself to do something you might forget to do when you get back to camp. 45. Wrap fragile items in several before placing them into a Backpack for a hike. 46. Wrap clothing within a rolled up bandanna for a pillow. 47. Repair a hole in a tent with a bandanna and a sewing kit...remember, if it rains, the repair will leak. 48. Tuck into a pocket of an animal's pack to show off and have yet another bandanna in camp. 49. Wear a bandanna to look good. Tuck it in a pocket, around your neck, around your leg or arm. You never know when looking good will become a life saver. 50. Tie a rope/cord/string around the edges of a bandanna, hang an action figure or small rock or stick to the rope and let a kid or bored adult see how high they can throw the parachute and watch it come down. See who can make one the best. Start with a bandanna each and a stick the same size. 51. Use as a place mat. 52. Hold a hot bowl or plate with a bandanna while eating in camp. 53. Set a bandanna on your lap for a place to rest a hot metal cup you are drinking from....oh, and if you need to be told, DON'T LET GO OF THE CUP WITH YOUR HANDS. 54. If you are in the woods, and there is no toilet paper, you might find yet another use for your bandanna. If you have your pocket knife, cut the bandanna into pieces. 55. Set over small items you do not want others to see. 56. Set your bandanna in the chair you are sitting in but must get up for a minute...mark your territory. 57. Once a month, and sometimes as a surprise, a woman might have forgotten to bring pads she needed with her. A bandanna, or several might just keep her clean. 58. If it is all you have with you, you might need it to help keep a baby animal warm and or dry. 59. Tuck into your change pocket to keep your change from rattling in your pocket. 60. Wrap ammo in a bandanna to keep it from rattling in your pack if the ammo is not separated in a section box. 61. Set a bandanna on your lap between you and your dirty dog. 62. Tie an injured animals mouth shut so that you can help it. 63. Tie an injured animals feet together so that you can help it. 64. Cover equine's or goat's eyes to work on them if injured. 65. Use as blinders on the trail with pack equine if in a scarey or dangerous area. 66. If you did not bring your gloves, use a bandanna when handling ropes or wires if your hands are injured or sore, or even just to keep them from becoming sore or injured. 67. Wipe your tears with a bandanna. 68. Set dirty shoes on a bandanna to keep the inside of your tent clean. 69. Place on in the toes of your hiking shoes at night to keep spiders, mice and scorpions out. 70. Do magic tricks under one. 71. If you are kneeling on rocks or dirt, place under your knees for padding. 72. Sew two together on three sides before heading out for your trip. The bandannas can still be used for about anything list here, and also be used for a large pouch, and a pillow (add clothing) at night. 73. Tie several together and make a rope. 74. Tie to a stick on all four corners and use to scoop minnows/bait for fishing. 75. Tie to a stick on all four corners and use to fish. 77. Place over the top of an open bucket as a dust lid. 78. Wrap around your wrist before popping something/someone with a punch. 79. When I was young and thin I made Halter Tops out of one bandanna each. 80. Before I hit the age of 35 y/o I used one for a belt. Now, I fear, I would have to tie two together to make a belt. But any person could do this no matter how large the waist. Just tie as many as needed together and tie at the waist. 81. Do you need to borrow shoes in camp that are tooooo big for you? Stuff a bandanna down in the toes of each, that way the shoes/boots will not flop around as much when you walk in them. 82. Wrap your binoculars in a bandanna in camp to keep the dust off of the lenses. 83. Sick in camp or at home? Put Vapo Rub on a bandanna and place it on your chest as you sleep. 85. Leave an extra bandanna in camp as a code to other campers of where you might be going. 86. Tie on trees on the way to camp to find your way back to the main trail. Be sure to not use your last bandanna to do this. You might want to cut one up so that you can mark more trees. 87. Use a bandanna to make smoke signals. 88. Write a message on one, if you do not have paper or you fear rain will wash paper away, to leave a message for someone. 91. In a pinch, cut a bandanna in half, diagonally, sew edge, and you now have two pieces of bandannas that can be used for most ideas above. 92. Hold it in your hand as you try to fall asleep listening to the wolves howl outside your camp. Rub it like a worry stone. 93. Use it to cover your ears from noises you do not want to hear at night in your tent as you try to sleep. 94. Did you bloody your nose? Use the bandanna to hold it so that it stops, and to keep the mess off of you. 95. Make a book cover with one, use it as you would for other fabrics. 96. Wrap a wire clothes hanger with one for decor and to keep fabrics more fluffed out and away from the wire. 97. Dry yourself off with a bandanna back in camp on a rainy day. 98. Use for coffee grounds, hold them overnight and use them again the next day. 99. Collect seeds while out on the trail, place them in a folded bandanna for transport home. 100. Use over barbed wire/between the fence and your hand to got through a fenced area. 101. Use to shooooo wild life away in your camp....wave it at them. Be careful, this might incise some to spray or come at you.